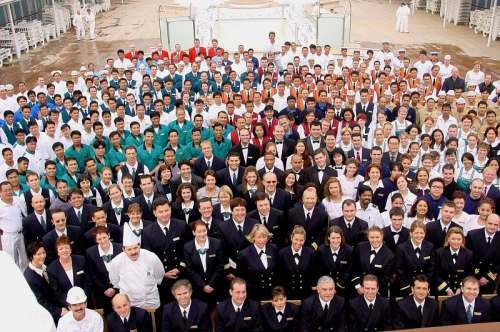 There are over 300 types of jobs onboard cruise ships spanning a number of different departments, each requiring their own set of skills and qualifications. Many of these positions are similar to land-based jobs offering potential for a successful career, plus the added benefit of travel. A cruise ship is similar to a resort offering comparable employment options in Guest Services, Housekeeping, Food and Beverage, Entertainment and more. “More” also means that a cruise ship is very different than a land-based resort, requiring a crew of Deck and Technical personnel as well. Most cruise lines separate their operations into two main categories, Hotel Operations and Marine Operations. Here is a breakdown of the cruise ship departments and the types of cruise ship jobs that can be found onboard a cruise ship. Marine Operations is responsible for navigating the ship from port to port, operating and maintaining the ship’s engines and hotel systems, providing shipboard safety and security, and complying with international as well as maritime rules and regulations. The Deck and Technical Departments consist of trained and experienced Officers and Ratings. Although the Staff Captain is head of the Deck Department, the Captain is the master of the whole ship with all heads of department reporting to him/her. Here is a list of all the cruise ship positions in the Deck and Technical Departments along with some other jobs that are sometimes categorized under Marine Operations. With more than a dozen operational areas, the Hotel Operations on a cruise ship is responsible for ensuring that each passenger may enjoy their cruise vacation. Departments include Guest Services, Housekeeping, Culinary, Food and Beverage, Entertainment, Gift Shops, Casino, and Spa. But, there are also jobs in Finance, Human Resources, Marketing, and Information Technology that work behind the scenes. The Hotel Director oversees the entire hotel operations, but ultimately reports to the Captain. Here is a list of all the cruise ship positions in the remainder of the cruise ship’s departments. For information about how to apply for these cruise ship jobs, read the How to Apply for Cruise Ship Jobs section.